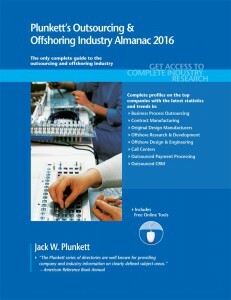 Dramatic Shift in Outsourcing to China—Rising Wages - Plunkett Research, Ltd. While India is the leading outsourcing center for services like back-office tasks, China has long been the world’s top offshore manufacturing center. China is clearly a leader in the offshore manufacturing of apparel and footwear. It also excels in the manufacture of computer components, such as motherboards and hard drives. Telecommunications equipment companies, such as ZTE and Huawei, have become world-class competitors, and Chinese firms have developed expertise in such high-ticket items as medical imaging equipment. China recently became the world’s leading retail car market as well, and has established a mammoth automotive manufacturing industry, along with a significant presence in aircraft and railroad equipment. However, China is facing rising costs and increased competition from other countries. In 2015, the average minimum wage was at an all-time high of $312 per month for China as a whole. When you add in factors such as productivity, shipping and logistics costs, China has largely lost its status as a low-cost producer. China will continue to evolve from a manufacturer of low-value goods such as apparel to a maker of more complex high-value items such as automobiles, consumer electronics, communications equipment and medical devices. It will apply its supply chain advantages, growing domestic demand and regional logistics power to sustain manufacturing. Lower-end, less-skilled manufacturing will, to a growing extent, move to nations that are less mature than China, where wage rates are much less expensive. For example, substantial apparel and textile exports to the U.S. are now shipping from Vietnam and Indonesia. This entry was posted in News on October 4, 2015 by Seif Hamed.